The aim and purpose of the habitability certificate issued by the Consell Insular, is to document that a building (a house, a commercial property, a flat or installations) meet the minimum size, and that technical and sanitary requirements are appropriate for those who occupy it. The cédula is required for first time use. Without a habitability certificate, the utility suppliers (water, electricity, gas, telephone) will not provide their services to the owner. The habitability certificate is valid for ten years and can be renewed thereafter. To add to the confusion – there are three different cédulas. 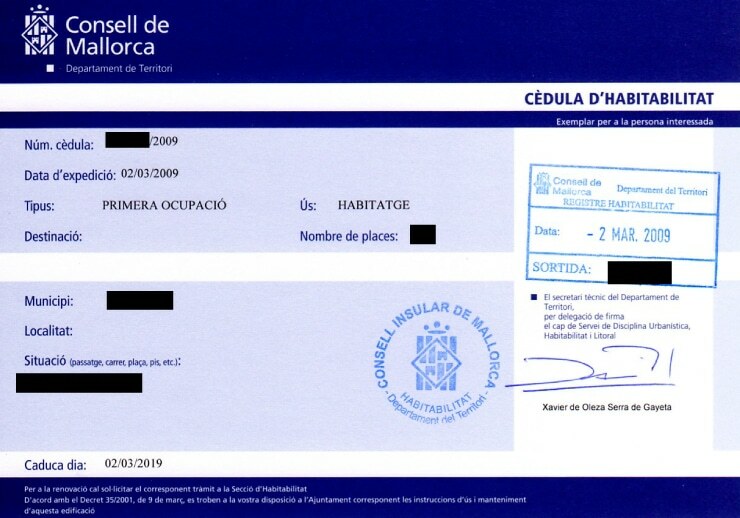 The first is the “cédula de primera ocupación”, the first occupancy certificate. This certificate is issued when a property is first completed, or when it has been extensively renovated, extended or changed its use. In order to obtain this certificate, plans and photographs of the building (signed by the architect), cadastral record, building permit and acceptance of construction work by the architect must be submitted. The second is the “cédula de renovación”, the renewal certificate. This is to be applied for after ten years. The application must be accompanied by proof of ownership, a current photo of the property – with the architect’s date and signature, a site plan with the cadastral data and a confirmation of habitability and that the structural condition of the property has not changed. Finally, there is the “cédula por carencia”, which can be applied for if the property was built before 1 March 1987 and for which no “cédula” has ever been issued. This certificate is subject to a simplified procedure: a document must be provided confirming that the building was completed before 1 March 1987, that no building infringement proceedings are pending in the town hall, and that after 1 March 1987 no structural changes were made. Minkner & Partner, your real estate agent on Mallorca, has experienced architects in its network who can help you obtain a habitability certificate or renewal of said if needed. We are happy to give you a recommendation.